Scientists discovered a fossilized pregnant ichthyosaur that is believed to have died roughly 180 million years ago. What interested the scientists is that scientists found between six to eight of its small embryos that were located between its ribs. Ichthyosaurs lived during the Early Jurassic era. They resemble dolphins and people often confuse them as aquatic dinosaurs which were present before the first land dinosaurs evolved. The dolphin-like reptiles weren’t typical reptiles, as they didn’t lay eggs, but instead, they gave birth to their offspring. They used to eat other reptiles, fish and marine invertebrate to survive. Discovering fossils of ichthyosaurs is not rare, especially in the UK. So far, scientists have uncovered five specimen that had embryos inside of themselves. The fossilized pregnant ichthyosaur was uncovered eight years ago near Whitby in North Yorkshire, England. The newly discovered specimen has the highest number of embryos out of the five pregnant ichthyosaurs. More importantly, the discovery marks the first time that reptilian embryos that originated from the Jurassic era were discovered in Yorkshire. 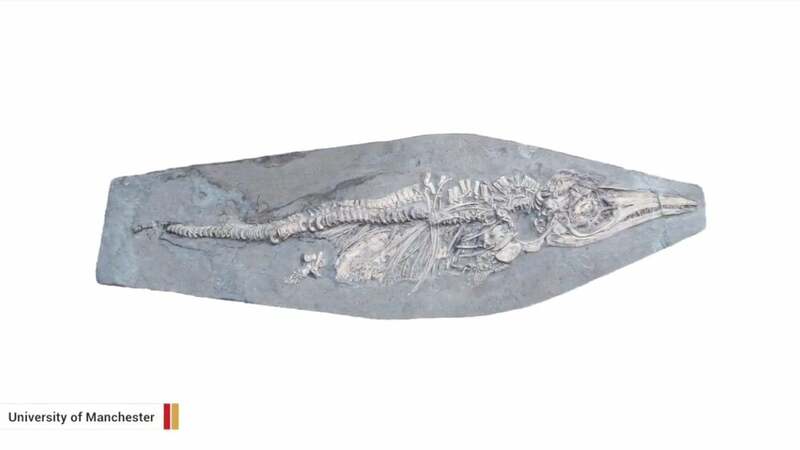 Scientists also discovered that the fossilized pregnant ichthyosaur was the youngest of all the other pregnant specimens, while the other specimens that were discovered in England are considered between 200 and 190 million years old. The specimen that was discovered in Whitby is thought to originate from the Toarcian Stage of the Jurassic, which indicates that it’s roughly 180 million years old. “It represents the geologically-youngest occurrence of ichthyosaurs embryos thus far recorded from the UK and the first such occurrence to be reported from Yorkshire,” University of Manchester researchers Dean Lomax and Mike Boyd wrote in the Proceedings of the Yorkshire Geological Society that was published on April 4. Several researchers suggested that the embryos were actually newborns or their remains that were swallowed by the specimen. However, after careful analysis they determined that it’s unlikely that the specimen would swallow six to eight newborn or aborted little ones at one time. The analysis showed that the embryos didn’t show erosion from stomach acids. Also, the embryos weren’t associated with content from the stomach that are usually found in fossilized ichthyosaurs that were living in the Early Jurassic period. The specimen which was analyzed was cut in half and polished. Then scientists displayed it at Yorkshire’s Jurassic World. The specimen is also supposed to feature newer technology to reveal the embryos and show how significant this discovery is. Thanks to the discovery of the ichthyosaur specimens, scientists are better able to see what was happening in prehistory. A study from 2016 revealed an early species of ichthyosaur that was scientifically dubbed Sclerocormus parviceps. The discovery is also significant because it shows what direction evolution took after a mass extinction event in prehistory that likely made 96% of marine species go extinct. In that study, researchers discovered that ichthyosaurs, followed by their relatives, swiftly developed and showed diversity, within the first million years of their evolution that occurred during the early Triassic era.